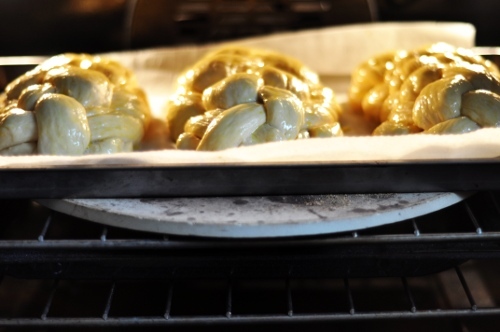 I can’t go another day without sharing my go-to challah recipe with you. It’s actually my mom’s recipe, which just goes to show that you don’t have to be born Jewish to inherit a perfect recipe for a most emblematically Jewish food. On occasion, I turn to the recipe in Joan Nathan’s splendid Jewish Cooking In America, her amazing oeuvre that reads the way I think a Jewish cookbook should – rich headnotes and historical asides paired with flawlessly-voiced procedures. Though I love Joan’s recipe, I confess that I find it a bit rich for regular use. I wax rhapsodically through phases of regular Shabbat observance in the form of Friday night dinners with candles and challah. For those weekly episodes, my mom’s recipe triumphs. Light and simple, the dough can be thrown together on Thursday evening and baked on Friday, either in the morning or just before dinner. To wit, I started a batch at 11pm a few weeks ago so that I could bake the loaves before work the following day in order to send them to friends in other cities (long story). A bit of mixing, a bit of kneading, a brief rest (while I cleaned the kitchen and brushed my teeth), and they were ready to shape before bed. Overnight, the refrigerator’s cool embrace slowly coaxed the yeast to plod along its flavor-making path gently and smoothly, just the way yeast prefers. Laboring while I slept, the bread readied itself for a morning bake. Perfect. In the morning, the smell emanating from the kitchen was warm and sweet. It crept down the hall and into our bedroom, rousing my sleepy husband who wandered into the kitchen asking “are there pancakes?” as he rubbed his bleary eyes. Thankfully, he wasn’t disappointed to find that I was making challah instead, and that one of the three loaves was for him. One request: please learn to say it correctly. HAH-lah. The first sound is a soft, guttural ‘h’ and not a hard ‘ch’ as in chalk. I should note that this dough is infinitely adaptable to whatever shape you like. In elementary school, my mom would shape the loaves to look like teddy bears, which we would adorn with chocolate chip eyes and noses before presenting them to my teachers as Christmas gifts. I will give you a few minutes to join me in giggling at the irony of using challah dough to make Christmas bears for my teachers in Utah, the only place where Jews are considered gentiles. It’s the little things that make me smile. Shabbat shalom, my friends. Combine 2 cups of flour with the yeast, sugar, and salt in large bowl and stir well. Add softened butter and stir again. It will not look at all combined – just a hugely shaggy mess. Add the hot tap water and beat with electric mixer at medium speed for 2 minutes until well mixed and elastic. You want your eggs to be room temperature, but don’t freak out if you can’t remember to set them out early to warm up. Put them in a small bowl with some warm water for a few minutes and they’ll be perfect. Add the eggs and 1 ½ cups more flour. Beat with an electric mixer at high speed for 1 minute or until thick and elastic. 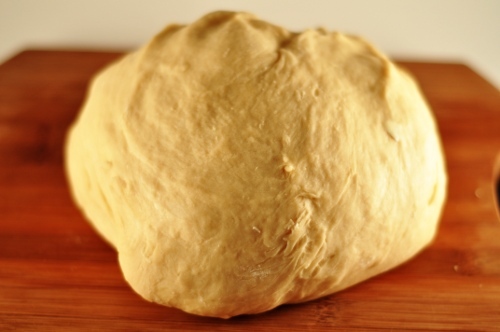 Gradually stir in enough of remaining flour with a wooden spoon to make a soft dough that leaves the sides of bowl. Turn it out onto a floured board, keeping at small dish of flour at hand in case things get sticky as you proceed. Knead for 5-10 minutes until it is smooth and elastic, adding some of the additional flour as needed to keep the dough from sticking to your work surface. Wash and oil the mixing bowl. Place the dough in the bowl, turn it over once to ensure it’s well-coated, and cover with a clean dish towel for 20 minutes. The dough will swell slightly, but do not expect an overtly visible change. To shape the dough, divide it into two even pieces. Set one piece aside and cover with the dish towel. Gently roll the first piece into a fat log to make it easier to further divide into equal pieces. I favor a traditional six-part braid, but three or four pieces also work well if you are more familiar with those braids. 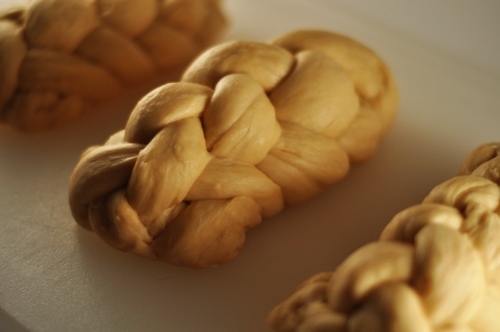 If you’re interested in tackling the six-part braid (and it really is divine when it bakes), watch this video (the beginning focuses on how to get the snakes of dough ready to braid; if you just want to know how to make a six-part braid, skip to the 2-minute mark). No matter which type of braid you choose, divide the dough into equal pieces and roll each piece into a snake. Aim to have snakes of equal length and thickness. Pinch the ends of the snakes together and braid until you reach the other ends. Tuck both ends securely under the loaf. Repeat with other half of the dough and set both loaves on a parchment-lined baking sheet. Cover loosely with plastic wrap and refrigerate for 2-24 hours. When you are ready to bake, remove the loaves from the refrigerator and let them begin to come to room temperature while you heat the oven to 355 (approximately 10-15 minutes). Beat an egg in a small dish with splash of milk and gently brush over the loaves. Bake them for 35-40 minutes, slightly less if you went with three loaves as they will be smaller. When they are done, the loaves will be a rich, golden brown and will sound hollow when thumped on the bottom. Two things to note: first, expect the loaves to grow substantially in the oven. Don’t be disappointed when you pull them from the refrigerator in the morning and find that they haven’t swelled to gargantuan proportions. It’s coming, I promise. Second, this is an extremely soft bread, so it is much better suited to tearing than cutting with a knife. If you must slice it, do it on the second day, when it will make killer French toast. I am totally going to make this, but I don’t get how the braiding works. It looks hard…IT’S TOO HARD! It sure is pretty, though. Will it be as pretty and delicious if I just, you know, shape it, maybe fold it in half or something? Yeah, probably not. The braiding is essentially this: number your pieces from 1 to 6, left to right. Take 6 and move it all the way to the left. Take 1 and move it all the way to the right. Now pull 6 back down to the middle. At this point you have a piece you pulled from the far left tossed over to the right, and the piece from the far right looped around the far left piece and laying in middle. Now, do it all over again, starting with the piece that’s farthest to the left. Pull it all the way to the right. Then pull that piece that once upon a time was piece 1 and pull it into the middle. Now you’ve done it on both sides. Lather, rinse. repeat. Or, better yet, try it with a regular old three-part braid. Actually, I think you could even get something sweet-looking by dividing your dough into 2 big snakes and twisting them around each other. It wants some shape, for sure, but it really can be very simple. Make it! And enjoy! 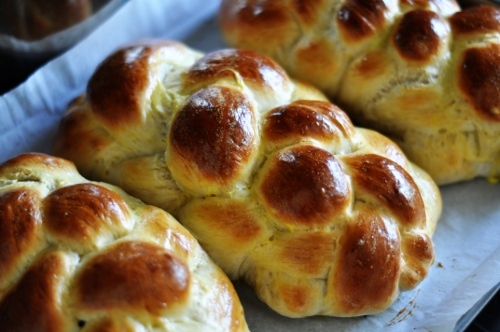 Love the Challah! Thanks for the braiding technique as yours looks perfect! I am going to try it next time i make it…maybe for the upcoming holiday. Thanks, Kathleen! Do try the braiding - once you’ve worked through it once, it makes sense. One of those things you just have to feel your way through. I made 2 loaves of the Challah bread. I did one loaf with the three braid and the other with the six braid. Mind you, I’ve never made Challah before and very little homemade bread of any kind. I’m just starting to be more creative since I sold my buisness and have more time. Well to my surprise, I did a very good job. Very easy recipe. Bread turned out wonderful. My daughter and grandchildren loved it. My question is, can you over need the dough, and if you do, what are the results. The texture of mine was very smooth, almost like pound cake, not dry at all very moist and flavorful. I was not sure if it should be so dense. I’m so glad it turned out well, Patricia. Isn’t it an easy recipe? People are always really surprised. I’ll be posting an update soon with notes on how to turn a half recipe into 8 perfect hamburger buns. On the kneading - yes, you can overknead and it can make your bread tough. If you are kneading by hand, it’s probably not going to happen since your arms would wear out before the dough gets to that point. It’s a pretty dense bread. Soft, but dense. What kind of flour did you use? I used Gold Medal white bleached flour. I did not knead the dough by hand, I used my mixer with the dough hooks. I had incorperated 6 cups of flour and then realized I needed to add another 3/4 cup. I ended up kneading the dough for about 15 to 18 minutes. We had eaten the first loaf the same day. Was very good, soft and moist. But extremely dense. Now by the 3rd day, what is left is very solid. Tonight, I’m going to make french toast out of it. I am going to make this again this weekend. That’s quite a bit of kneading, especially if you’re using a mixer. Next time, try using the dough hook for 10 minutes, then giving it a few turns by hand on a clean cutting board for a minute and see what the consistency is like. It should be ready by then - I’m concerned that you’re ending up with denseness from overworking the gluten. One way to test to see if it’s ready is to do a windowpane test - take a small piece of dough, about half the size of a golf ball, and stretch it out flat with your fingers. If you can make the center nearly translucent without tearing it (like a little windowpane), you’ve reached the structural level you’re looking for with the gluten. Kneading time is definitely something to keep in mind - there’s not a lot to be gained by going far beyond the point where it’s first ready. Thank You. I will try the windowpane test. I’m going to mix up another batch tonight. I don’t say this unless I mean it, but I’m going to make this!! Not Jewish myself, I worked at a Jewish school for three years and brought home a loaf of Challah every Friday when the bakery delivered loaves to the school for families to take home. LOVE the stuff but have never made it myself. I’m happy to come across such a great recipe! Thanks, Lori! I think you’ll enjoy it. The hands-on time is pretty minimal and the results are fab. And since the recipe makes a haul, there’s always some to share (though, in truth, I’ve been making a half recipe recently to stave off the otherwise inevitable weekly bread coma on Saturday mornings). Hi, I used your recipe for your challah bread. I didn’t refrigerate it cause I forgot and It it rise for over an hour for the first rise then I made one 6 braided loaf and with the rest I made some knotted rolls. After they were formed I let rise on my stove for about 45 min to an hr while the oven was warming. I also used a whole cup of sugar cause I like my hallah a bit on the sweet side I also forgot the splash of milk. You would think it would have turned out disastrous but it was the best challah I’ve ever had, and the baked up quite beautifully. It’s so close to Swedish Christmas bread minus the cardamon seed. I made another batch this morning and added some cardamon just to try it out. We’ll see how it turns out but I have no doubt it will be great. Your recipe is great thanks for sharing! Thanks Catherine! It’s a very forgiving recipe - I have also forgotten to refrigerate the dough and found that everyone worked out just fine after a decent rise on the counter. I love the idea of adding cardamom. The Salty Spoon is powered by	WordPress 2.7 and delivered to you in 0.257 seconds using 24 queries.